China responded to the latest US tariffs with tariffs of their own of between 5-10% on $60 billion worth of American imports. Looking at markets, you’d think nothing had happened! After an early wobble, the index powered 0.7% higher to close at its highest level since January, helped by gains in some counters that had been previously negatively affected by earlier tariffs. The S&P500 failed to hit a new record high above last month’s peak while the Nasdaq held a healthy bounce of the 55-day moving average. The US dollar, measured against a basket of six currencies, rose 0.15% as US 10-year yields climbed to their highest since May. Across Asian equity markets, sentiment was not quite so bullish, though most indices did trade in the black. The Nikkei edged a 0.03% gain while China shares rose 0.77% while the Hang Seng gained 0.68% by lunchtime. The US dollar maintained its bid bias with USD/JPY hitting its highest in two months as US yields held their higher levels. On the latest tariffs, ratings agency S&P commented that it saw that the aggregate impact of both tariff and confidence effects would be more pronounced on the US economy than China’s. A full-blown trade war, with tariffs of 25% on all non-fuel goods, is seen shaving 1.2% off the US’ GDP over 2019-2021 with the loss for China about 1%. Their major concern is that China may start responding with non-tariff actions, once tariff possibilities are exhausted. 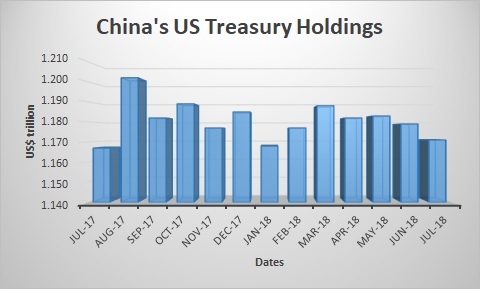 Possibly in a hint of things to come, recent data released by the US Treasury Department showed that China’s holdings of US Treasuries fell to a six-month low of $1.17 trillion in July, down from $1.18 trillion in June. While some say the selling may have been to fund USD/yuan sales to support the local currency, others fear it may be a partly in response to the US imposing tariffs on Chinese goods. The Bank of Japan left its benchmark interest rate unchanged at 0.10%, as expected. It also maintained its 10-year JGB yield curve control at about 0%, also as had been expected. The vote on yield curve control was 7-2, with members Harada and Kataoka dissenting. The central bank also maintained its annual pace of JGB holdings at 80 trillion yen and annual ETF purchases at six trillion yen. Given the non-event style of the decision, USD/JPY barely moved afterwards, stuck at 112.36 and holding close to its two-month high. On the eve of an EU summit in Austria, UK PM Theresa May spoke with the UK’s Express  newspaper saying the withdrawal agreement is virtually agreed and would be the right plan for the UK and deliver a good deal for the EU. She also warned that calls for a second referendum risks shattering trust in the government. Talking about the rumored plot against her leadership from within her own party, she insisted she plans to stay in Downing Street to deliver a program to transform Britain long after next year’s Brexit deadline. GBP/USD touched an eight-week high of 1.3176 early in today’s session and is testing the 100-day moving average at 1.3165. The pair has not closed above this moving average since April 26. GBP/USD is currently sitting at 1.3155. We get to see the whole range of UK price indices for August today. Producer output prices are expected to rise 0.2% from July, while consumer prices are seen jumping more, with a 0.5% increase over the previous month. Retail prices are also expected to rise from July, with a 0.6% gain forecast. Euro-zone construction output for July completes the European session. The only US data today are housing starts and building permits for August, along with the Q2 current account balance. That is expected to show an improvement in the deficit to $103.5 billion from $124.1 billion. The day is rounded off with a late speech by ECB’s Draghi.